The Box: or how I learned my memories is a collaborative experience that was installed as part of a group show. Opening Friday, February 26th from 7-9pm. The piece is one of three works created by collaborative team Julie Jent, Karl Stevens, and Matt Swift. Human beings have a box within that contains the power to travel through time. The box can show the past, present, and future. The box contains all the people, places, and pieces of existence. As the box travels through time it collects everything it can until it is full and can travel no more. When the journey is over, the box opens up showing the immortality that comes from shared experiences. The box is then exposed to the winds of change; releasing all that was once held so tightly inside, hoping another box in some place, in some time will contain a singular shared experience that can live on forever. 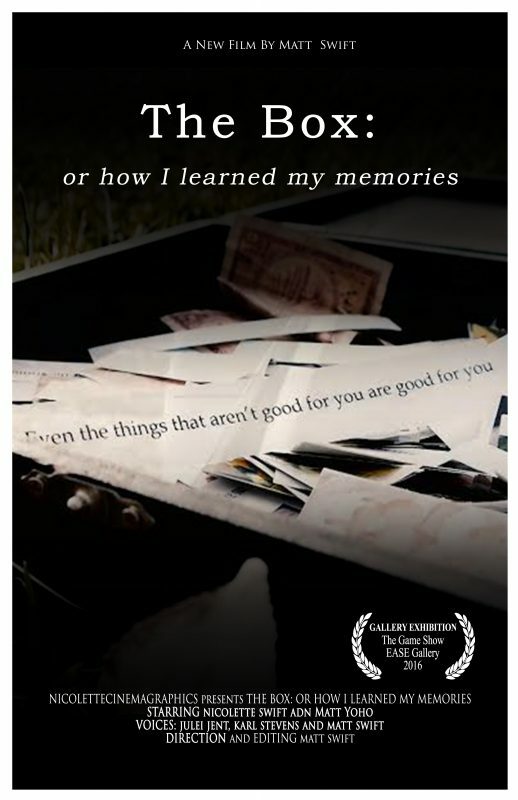 Teaser – The Box or: how i learned my memories from Nicolettecinemagraphics on Vimeo.